Serial ports on USB 2.0 allow further use of existing devices, even when the computer doesn’t offer serial ports. The USB-2COM-PRO is extremely flexible in offered communication standards, including Auto Setup for Windows, Linux, and Mac. The Industrial PRO Line supports flexible RS232/422/485 ports. Each port can be individually configured by software (No Jumper). The ports have standard DB9 male connectors. The metal cases can be easy used for DIN-Rail mounting, the 8- and 16-port versions also fit in a 19" rack mount. The high speed serial port with 128 byte FIFO allows high speed communication between host and device, even in heavy loaded systems. Unique features reduce the system load. The serial port also allows unusual speed settings like 500.000bps. 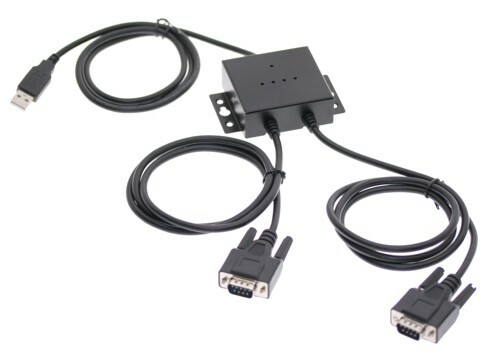 The 2X232P1 USB 2.0 to Dual Serial Adapter features our USB 2-Port serial adapter cabling which allows 2 serial devices to be connected to a single USB port. It provides a simple way to add serial ports to any Laptop or Desktop Computer. Industrial CoolGear Adapter features the best components, including FTDI FT232RL Chips, Mutli-TT USB 2.0 GL852 Chip and ZT213LFEA Zywyn Corporation Very Fast 921.6K bps UART Chip. Our USB to serial adapter complies to FCC/CE and RoHS guidelines, uses a metal industrial quality shell and UltraFlex USB and Serial Cables. 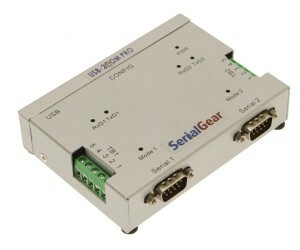 The 2X232P1 USB Dual Serial Adapter is designed to make serial port expansion quick and simple. 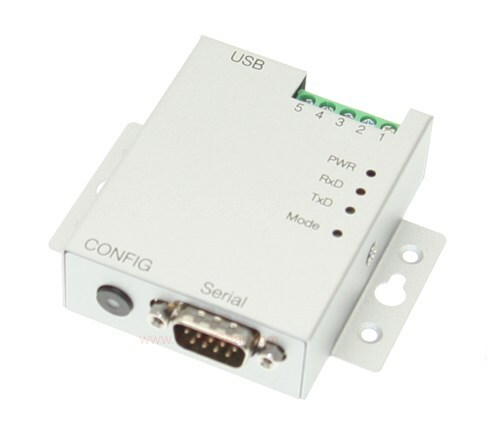 Connecting to a USB port on your computer or USB hub, the USB Dual Serial Adapter instantly adds two RS-232 serial communication ports to your system. By taking advantage of the USB bus, the USB Dual Serial Adapter makes it easier than ever to add serial ports and serial devices to your system with easy plug-and-play and hot plug features. Plugging the USB Dual Serial Adapter to the USB port, the adapter is automatically detected and installed. There are no IRQ & COM port conflicts, since the ports do not require any additional IRQ, DMA, memory as resources on the system. The USB 2.0 Dual Serial Adapter is bus-powered, and it works with the USB host port supplying power of 500mA. USB-to-Industrial Single Port RS-232/422/485 Adapter.USB PRO Series Software & Hardware Configurable with rugged metal case for industrial applications.